I have confirmed my membership status in YPC is in good standing. I have read and understood the 2019-2020 YPC Board Member Requirements & Expectations (below). I have read and understood the individual Board position description(s) of the position(s) applied for (See menu options for open positions and applications). I have submitted a Google Form application for each Board position applied for by Sunday, October 21, 2018 at 11:59 PM. I have emailed my resume to treasurer@ypcdsm.com by Sunday, October 21, 2018 at 11:59 PM. The current YPC Board will review the applications and select a candidate for each position based on a majority vote. The proposed slate will then be voted upon by the YPC membership via an emailed, electronic ballot. If approved, the current and incoming Board will begin transitioning in November, with the official transition of the Board taking place at the YPC Annual Gala. 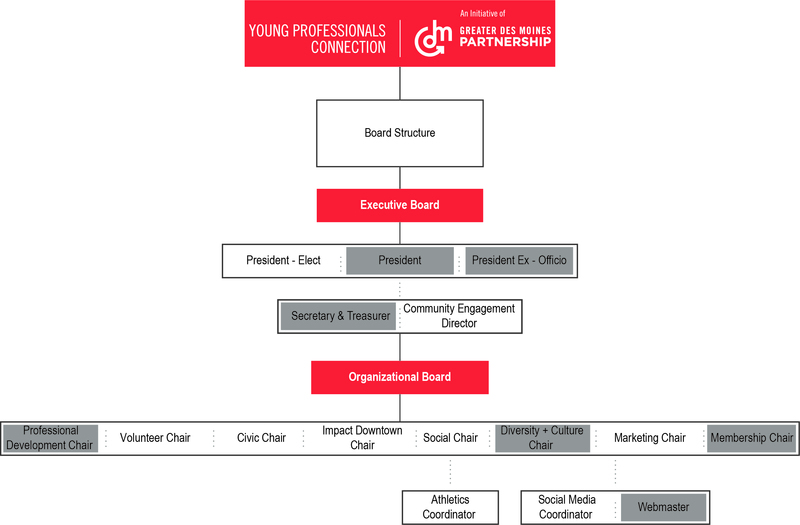 Contact presidentelect@ypcdsm.com with questions about the election process or board structure. Note: Positions in grey are not open for applications for the upcoming term.